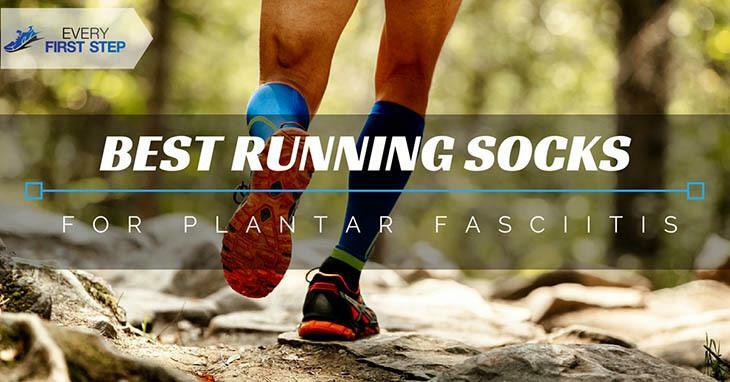 →What Are The Best Plantar Fasciitis Socks In 2018? Find Out! Ever since I started wearing flat, comfortable shoes instead of high heels, I haven’t woken up with sore feet. Thanks to hubby’s good taste, my heel pain is all but gone. The only problem I face now is my feet get sweaty and smelly when I walk all day in closed shoes. I know wearing socks will be a great help but I want to find the best plantar fasciitis socks to make sure I don’t aggravate my condition by wearing the wrong kind of socks. After doing a bit of looking around and research, I found five socks for plantar fasciitis that I highly recommend if you have the condition yourself. First on my list is the compression socks by Compression Z. The reason why I think this product should be on the top is the price is just right for a compression sock and the quality is excellent. Since I have very sensitive and sweaty skin, one of my favorite features is the anti-microbial, anti-itch material used. The compression sock also provides enough support to protect against tripping by stabilizing the foot. Since I live in a tropical country, wearing thin, flexible material is a must. This also ensures that the sock will fit into any of my shoes. The material used also gives a reasonable amount of compression without squeezing your foot too much and leaving marks. Because the material is lightweight, it is comfortable enough to wear all day and even all night. ​On top of that, the compression socks come in different colors from red to blue and off course pink! On the other hand, if you are looking for something with more compression for high-intensity sports, the Compression Z socks may not be a good choice. Also, since the fabric is thin, you may still need to use insoles for extra support. Although the Compression Z socks are my first choice, I would consider purchasing the Compression sleeves by Bitly for activities that will create tension in the legs such as running. The product provides superior compression with interlocked stitching to ensure a better fit. I also liked the fact that they are specifically designed for athletes and can sustain high impact activities. Despite the fact that the material is quite thick, they are still comfortable enough to be worn around the house. The socks can also reduce pain experienced when walking according to many reviews. The material is breathable and soft making it comfortable enough to wear at night. When running, the socks hug your feet and ankles to provide stability. Unfortunately, I found that the foot portion is too short and at times cuts into the top of my foot creeping downward. If you have high arches I wouldn’t recommend choosing these socks. Since it would be my first time to purchase compression socks, I was interested to look for something I could get on a tight budget. The compression sock has targeted ribbing arch support which increases the comfort level greatly. Another great thing about the sock is they can help with the swelling that comes with plantar fasciitis. The form-fitting, lightweight fabric gives ample joint stability no matter what activity you are doing. The sock also has a unique heel poach or cup which helps it to fit easily and not slip off. Because the seams are in the right trigger points for plantar fascia, there are no ‘hot spots’ of compression. Also, the locations of the hem are perfect so there is no squeezing of your toes. Sadly, the socks are designed with men in mind and might run too large for women. If you don’t suffer from plantar fasciitis, the socks may be too tight for your liking. If you are looking for a high-quality sock and don’t mind spending a little bit more, I would recommend the Foot Compression Sleeves by Thirty48. I was impressed by the elastic design which does not restrict movement and allows you to wear them during any activity. The material is made of nylon and spandex and is thin enough to be worn under a pair of socks. The compression sleeve has a graduated 20-30 mmHg of pressure compression which helps stabilize the foot and avoid misalignment. Another unique feature is that each sock has written “left” and “right” on them to make sure you put the right one on. Even people who don’t suffer from plantar fasciitis can use the sock without problems. Something I didn’t like is that the sock is quite long reaching up to the mid leg. So if you want a shorter, less conspicuous sock, I wouldn’t recommend it. The socks may also run too small if you have large feet. If you have flat feet in addition to your plantar fasciitis, you will need a compression sleeve that provides more arch support than normal. I came across the Plantar Fasciitis sock with arch support by Physix and think it is the best choice. One of the first features that impressed me was the compressed ribbing in the arch area which provides targeted compression. The sock also stays in place compressing the entire foot without hindering motion. The sock also features an ankle support which relieves pain by compressing the plantar fascia ligament. To ensure that the sleeve doesn't slip off, a no-slip cuff has been stitched on both ends. In addition, the sleeve is lightweight and can be worn with any kind of footwear. Something you should know though is that the sleeves may be too tight for wide feet. Some have also complained that the sizing is too small so keep this in mind if you plan to purchase. Even if you suffer from Plantar Fasciitis, your feet are unique and require specific kind of compression. If you are new to using compression socks or sleeves like me, you need to be extra careful about what you choose. Making a wrong choice could mean either too much or too little compression. Let’s talk a little bit about some of the benefits compression socks offers and then we'll discuss some things to consider when making your choice. Basically, compression socks prevent your legs and feet from getting painful especially if you are on your feet all day or suffer from a condition such as Plantar Fasciitis. Another benefit is that the socks can prevent your feet from swelling which is one reason why some pregnant women also use the product. ​For people with foot conditions such as flat feet, compression socks can provide enough support to help stabilize the foot and prevent falls. According to one study, about one in ten triathletes use some form of compression sleeve or sock and have experienced reduced pulled muscles and muscle soreness. (2) The question is: does it really work? On the same topic of muscle soreness, another study found that runners felt a lot better after using compression socks in the 72 hours after running a marathon. The claim of compression socks being able to reduce or prevent the development of deep vein thrombosis was examined in a study performed by the University of Newcastle. Before wearing a firm compression sock (30 mmHg above), it is best you first consult a physician. This is another feature you ought to decide upon depending on your specific preferences. If you intend to use the compression socks underneath a pair of regular socks, you would want to get a thin, lightweight sleeve. In addition, if you have sweaty feet like me, then you would want something that offers ample breathability. All the proof I have found left me convinced that selecting the best plantar fasciitis socks was a good decision. The winner for me is the Compression socks by Compression Z. Aside from being affordable, it offers medium compression which works for a beginner like me. If you are looking for something to use during intense activities, then the Compression Sleeves by Bitly are a good choice. For those who want to play safe and get the cheapest product first, the Sleeve by SB SOX is a good option. On the other hand, if quality with a price isn’t an issue for you, Compression Sleeves by Thirty48 is the choice. Lastly, if you are looking for the best socks with good arch support, the Physix socks are a good option. No matter which compression sleeve you select, always remember to look for something that fits your needs. Remember to consider the compression zones, breathability and material used.